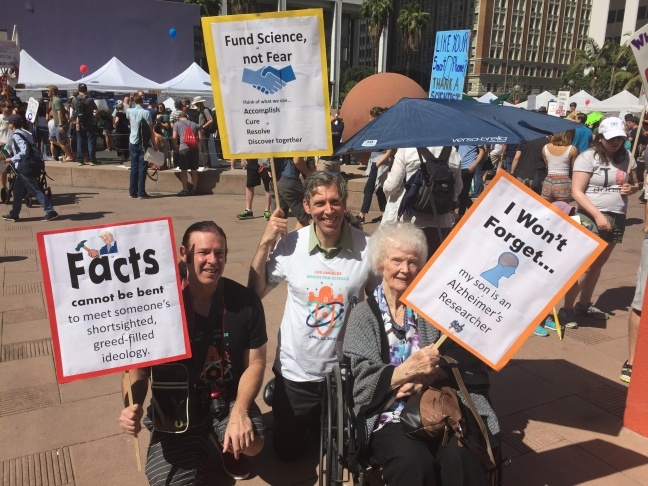 Michael Sawaya, a biologist at UCLA, is joined by his brother and mother at the March for Science in Los Angeles on April 22, 2017. 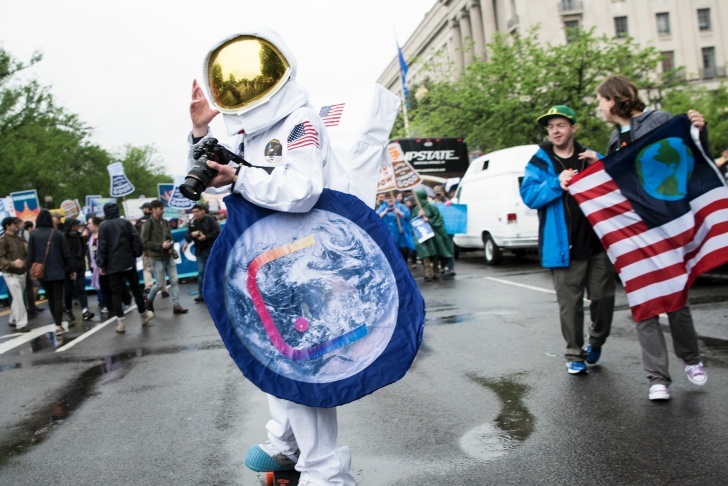 People gather at the March for Science on April 22, 2017 in Washington, D.C.
People gather at the March for Science on April 22, 2017 in New York. 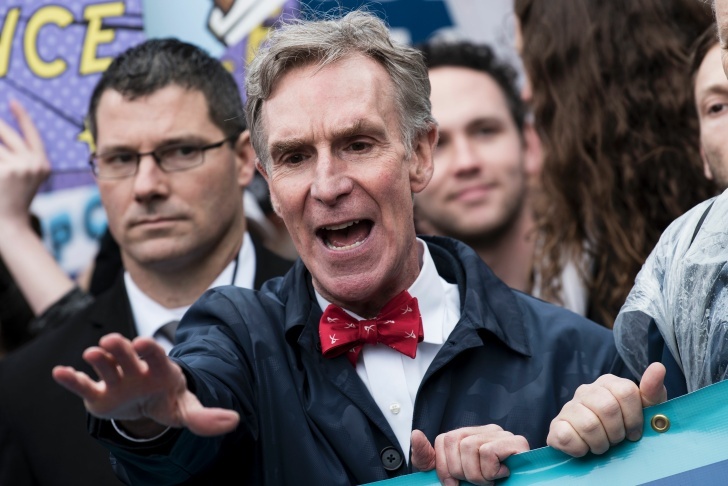 Bill Nye "The Science Guy" gestures as people gather at the March for Science on April 22, 2017 in Washington, D.C.
People walk past the Trump International Hotel and Tower during the March for Science on April 22, 2017 in New York. 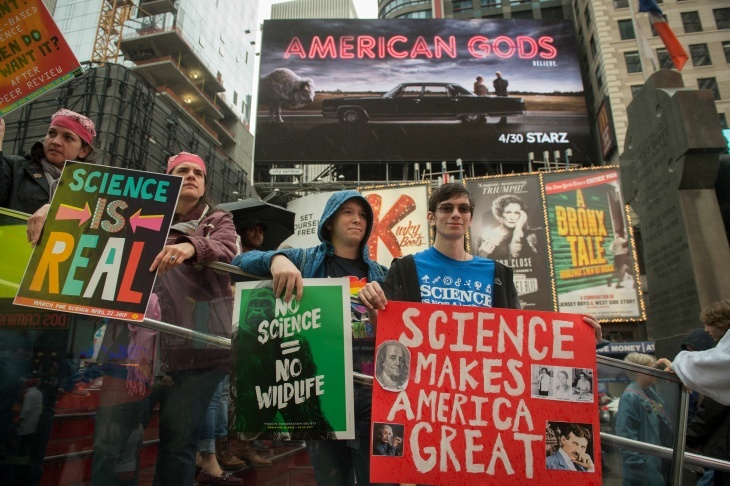 People stand with signs in Times Square at the March for Science on April 22, 2017 in New York. 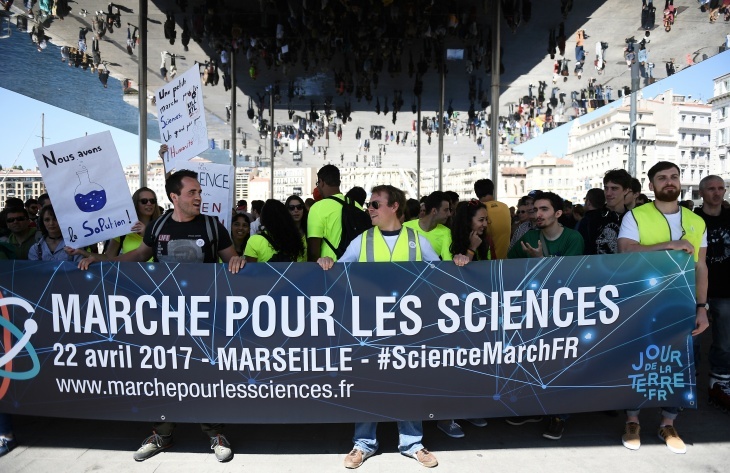 People gather at the March for Science on April 22, 2017 in Marseille, France. 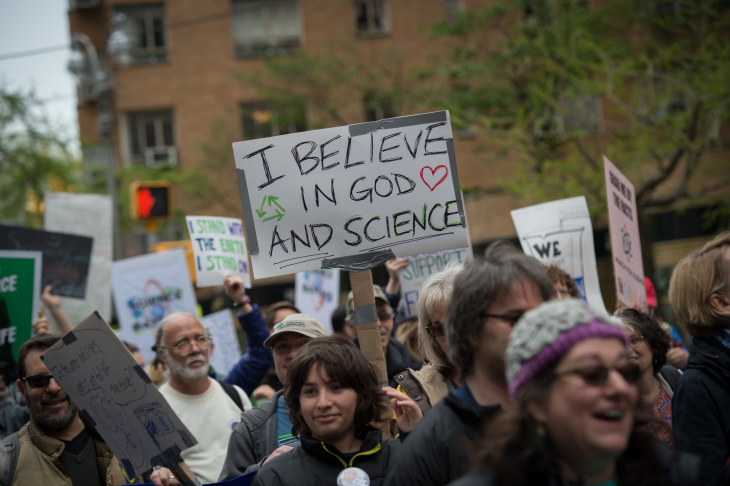 UPDATE: The Los Angeles Fire Department estimates that 10,000 people showed up to the L.A. March for Science. Rebecca Fuoco, director of media relations for the event, estimates the numbers at 25,000 to 35,000 people but tells KPCC, "To be scientific, we will wait for aerial images to confirm the final number." 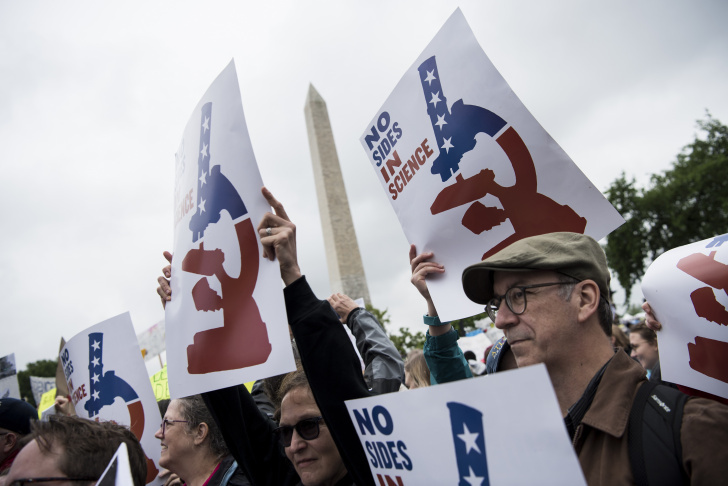 The main March for Science is being held Saturday in Washington D.C. but rallies to show support for fact-based research and environmental protection are being held around the world. That includes one in downtown Los Angeles. KPCC environment reporter Emily Guerin spoke with Alexandra Molina, a UCLA undergrad from Covina, who joined the event in Pershing Square. 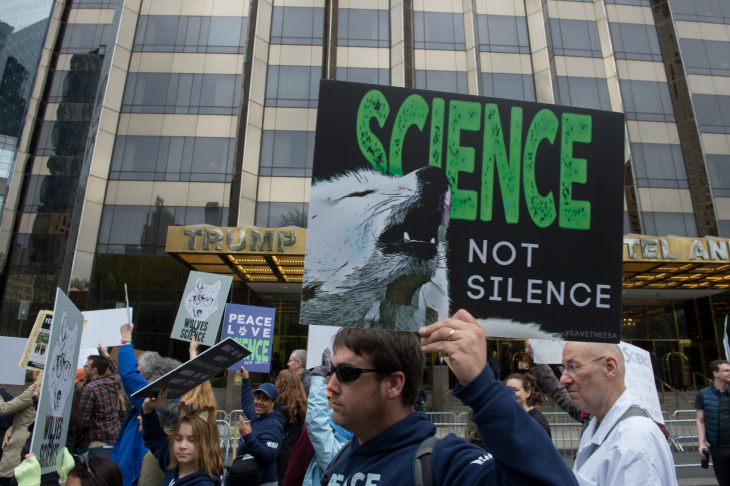 Molina, an aspiring wildlife biologist, worries about President Trump's proposals to cut funding to the EPA and other institutions that fund research. "A lot of people in my major always have the back-up plan of turning to government positions, and I know they're really worried about money being taken out of that field and not having job to turn to," Molina tells KPCC. 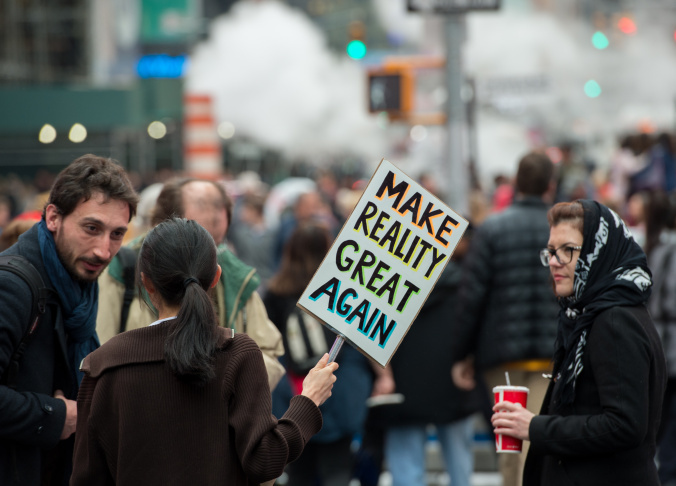 She says as a woman in the sciences, she feels threatened and thinks it's important for scientists to prove their worth in this current political climate. 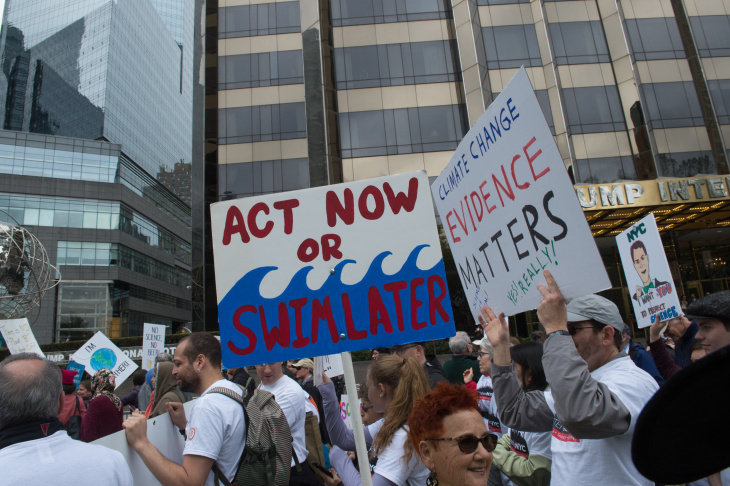 "It's easy for us to overlook how important science is to our everyday life. So people need to be reminded of that. And that's another purpose of today," Molina says. Michael Sawaya, a biologist at UCLA who researches the structures of diseases, is here with his brother and elderly mother. From her wheelchair, she holds a sign that reads, "I won’t forget, my son is an Alzheimer’s researcher." Sawaya says he was alarmed by President Trump’s budget proposal to cut nearly $2 billion of funding from the Department of Energy's budget. 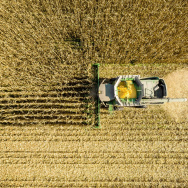 He says he routinely uses sophisticated X-ray machinery at Argonne National Laboratory in Chicago, which is funded by the DOE, for his research. If funding to the national labs is slashed, Sawaya says, "It’s going to hurt us. 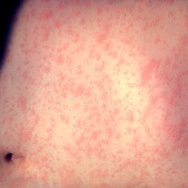 It's going to slow down our efforts to fight these diseases." 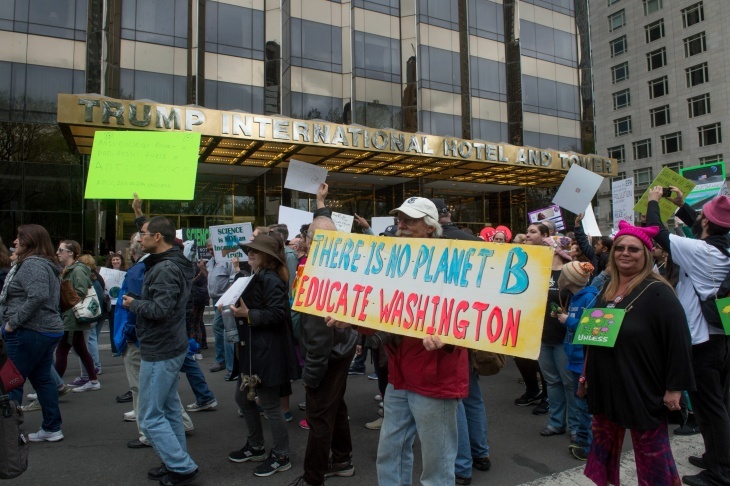 There’s another element of Trump’s agenda that worries him as a scientist and it doesn’t concern federal funding. 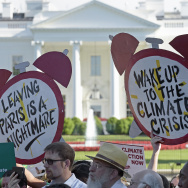 "A lot of what we do is in collaboration with scientists around the world and inhibiting their entry into the United States is another way of impeding our progress." A bit north of downtown, the brains at Pasadena's CalTech are hosting another of the many Marches for Science happening today. The on-campus event started at 8:30 a.m. with speeches and scientific activities for kids and grown-ups. 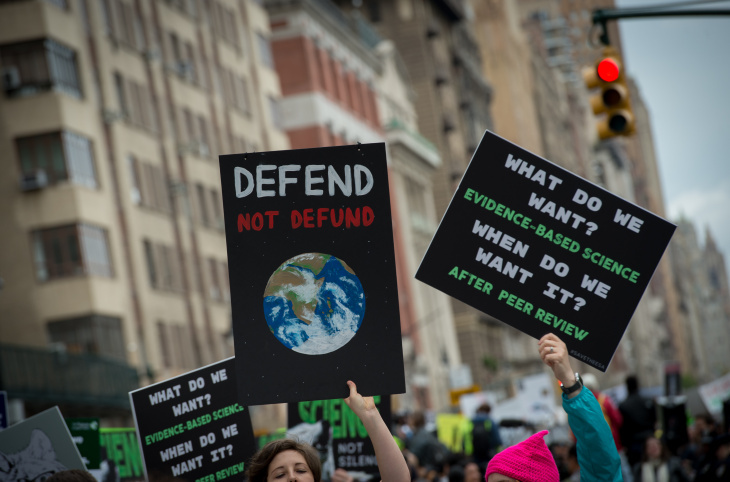 The marches have generated conversations around whether or not scientists should involve themselves in politics. 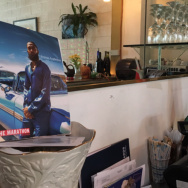 Jason Marshall, a post-doctoral fellow at the university and one of the event organizers, tells KPCC, "Our big intent is really kinda three fold: We want to celebrate science, we want to advocate for science; we wanna to celebrate ties between science and local community." 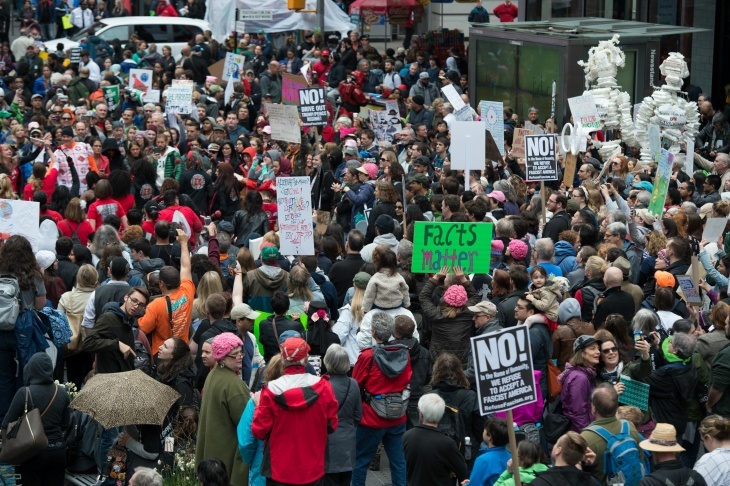 In Southern California, the list of planned marches includes events in Palm Springs, Palmdale, Long Beach, Fullerton, Coachella, Ojai, Ridgecrest, Hemet, Riverside and Santa Barbara.